August 1, 2015 at 2:49 pm. 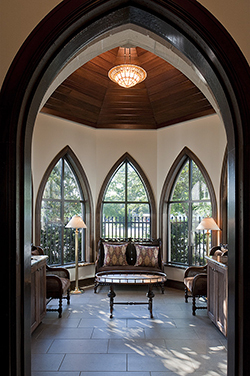 For each church, educational spaces will be quite varied: some small, some large, some flexible, some very specific. For a design to facilitate the varied forms of religious education, it must be based on an understanding of the specific needs and goals for a particular ministry. In most churches, we find a need for a range of adult education classroom spaces. Often, churches define their adult education curriculum based on age range or life stage; as such, classroom spaces need to be sensitive to the group of people using them. 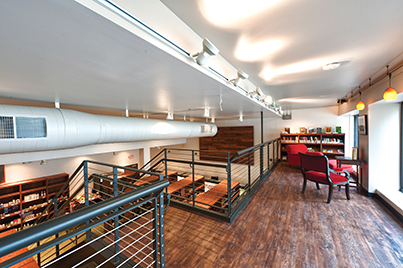 Few other building types require such a mix of spaces and intended users. Adult classrooms in churches must be able to meet the needs of college students, emerging young professionals, young parents, parents of teenagers, empty nesters, grandparents and retirees alike. With such a broad range of ages and preferred learning styles, having a mix of classroom types is advantageous. Typically, there is only need for one large adult classroom. These larger rooms are sometimes outfitted with operable wall partitions that allow for the room to be subdivided; however, we find that these are rarely used. 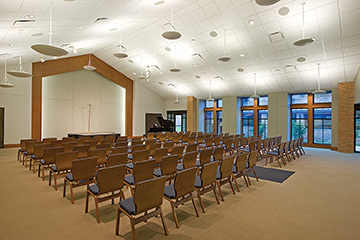 When churches have this large classroom, it will seat anywhere from 50 to 150 occupants in lecture-style seating — typically in rows of chairs and without any writing surfaces. This type of room also is often a multi-use room. And, because of its size, it makes an ideal small banquet room or group breakfast gathering area. As such, it should be located in proximity to a hospitality kitchen. This type of room also tends to be outfitted with a true stage, lectern and sound system, which makes it useful for small worship gatherings as well as l arge-group Sunday School / Bible Study classes. These rooms are often used for the senior adult classes or gender-specific classes that draw large crowds. In this type of room, a good rule-of-thumb is to plan for 15 to 20 square feet per person to allow for ample seating and stage space. Small group classes will accommodate fewer than 50 people — typically, 10 to 35. In a small group lecture format, the classroom needs to be large enough to allow for writing tables. Plan for 35 square feet per person if occupants will be seated at tables facing the front of the classroom. These types of classrooms must be outfitted with whiteboards or smart boards. A projection system or TV is nice, but not necessary. And, and rarely do these classrooms have any audio systems associated with them. Sometimes these rooms have some built-in wall storage, allowing volunteers to have an in-room space to store class materials. These spaces are often booked for new-member trainings or Bible Study classes that are a little more academic in nature. These classrooms are a little less formal than the lecture-based classrooms. Although lecture-style learning can happen in these rooms, they are not designed for extensive note-taking. These classrooms can be a little smaller since only loose chairs are needed. Al locate 20 to 25 square feet per person in these rooms. Like the lecture-style rooms, these classrooms should have whiteboards and TVs, though audio systems are rarely used. Sometimes these classrooms might even have sofas or lounge furniture to lend a living room feel. These types of classrooms are often packed with couples’ classes (Young Marrieds, Empty Nesters and so on) as they facilitate curricula that allow for much more dialogue and discussion. As Millennials become a larger presence in the church, the informal classroom has become a growing a trend. These spaces range from café-style seating, to couches tucked into an alcove, to small seating areas along large corridors, or even outdoor spaces. These classrooms can be completely fluid, allowing for quick rearrangement as needs arise. Or, they can be a little more defined. 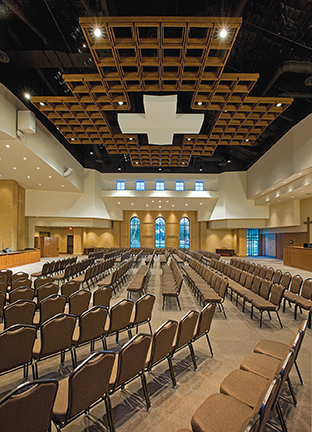 Many churches are taking cues from current trends in office design and using low walls or interestingly shaped partitions in central gathering areas to define multiple classroom spaces within the central commons. Because these spaces are so dynamic, they can be difficult to plan. If you are in an existing building, take stock of your corridors, lobbies and transition areas. Are there natural areas where the corridor widens? Could you remove a portion of an existing classroom wall near an entrance lobby? If people tend to naturally gather at a certain spot, could you widen the corridor? These types of spaces tend to be more intimate than a typical classroom and generally should accommodate five to 15 people. In an effort to get as much bang for our buck, adult classroom spaces are often crammed down long hallways or stuck in the core of a building, with no exterior windows. This makes for a dreary, institutional feeling. Really think about these spaces; try to structure your programming so that every classroom space has some natural light. If this is not possible, think about replacing portions of the walls with storefront glass. Having large panes of glass can give the illusion of natural light, helping to make a space feel less confined and more open. This also delivers the added benefit of providing visual security. Allison Parrott is the Project Manager for the Worship and Education Studio at Ziegler Cooper Architects in Houston. She is married to a church-planter and pastor and is blessed to be able to serve other churches through her professional work. 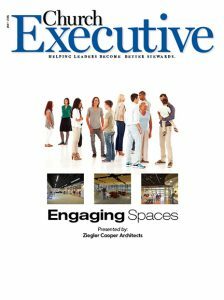 Paul Lodholz, AIA, LEED AP is the Principal-in-Charge of the Worship and Education Studio at Ziegler Cooper Architects. He has lectured around the country on the changing nature of the church lobby and has been working with churches for more than 35 years.